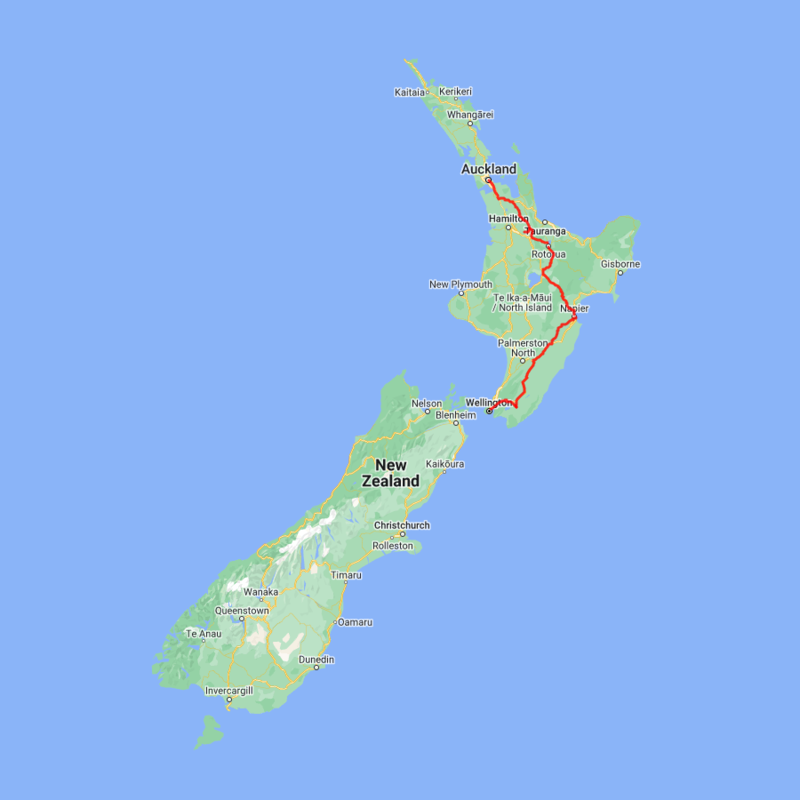 Explore the North Island from Auckland to Wellington on this short 'Taster Tour'. In Rotorua you'll be introduced to Maori culture through an informative and tasty discovery of the cuisine. You then journey to the beautiful Hawkes Bay, home to New Zealand's oldest vineyards. With time to discover the wineries for yourself during the day, you are then treated to an amazing progressive dinner at some of the top winery restaurants with matched wine tastings. From Napier travel south to the village of Martinborough, a hidden gem within New Zealand's food and wine scene. You'll be introduced to the delicious artisan delights that are being made here. The last leg of your 'Taster Tour' brings you to the capital city of Wellington, a hub for foodies and the best place to experience New Zealand's cafe culture. Take the drive south on State Highway one through the rolling hills and dairy pastures of the Waikato region. 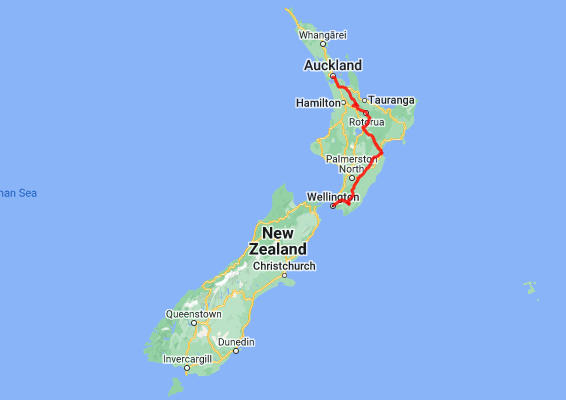 As you reach the outer boundary of the greater Auckland area, turn inland towards Matamata. This is the real Middle Earth, and it's here you can see many locations used in the filming of The Lord of The Rings and The Hobbit - as well as visiting the actual set of Hobbiton. Just south of Matamata is the township of Tirau, home to the largest tin sheep and sheepdog, but it also offers a surprising number of bric a brac, art, craft and antique stores if you feel like browsing. Considered the cultural centre for the Maori people, Rotorua is the ideal place to gain an insight into the history and culture. The Rotorua Museum located in the government gardens is outstanding and its displays and presentations focus on the local Maori tribes and the major events through history that have affected them. Dominating the display is the devastating volcanic eruption of Mt. Tarawera in 1886 but also of great interest is the Maori battalion display which portrays stories of this once feared military unit. Nearby Ohinemutu Village is the original site of the first Maori settlers in the area and despite its now modern surroundings and buildings you can still gain a sense of what the original village was like. The magnificent meeting house and historic carvings along with the unique 'Tudor-style' St Faiths Church feature in many visitors photo albums. One of the most popular introductions to the Maori Culture is through an evening at Mitai Maori Village where you can enjoy performances and demonstrations followed by a traditionally cooked hangi meal. Of course Rotorua is also a great place to enjoy many other activities including, fishing, 4WD trips, relaxing spa treatments, mountain biking, walking and hiking plus helicopter and float plane trips. The Dome occupies the top two floors of the grand and historic 1937 T&G building, an iconic Art Deco masterpiece in the heart of Napier. The vibe of New Zealand’s Art Deco city is right outside the door, yet The Dome’s elevation enhances the serenity and seclusion. With settler-style Wairarapa accommodation nestled in a charming rural location, you’ll find everything you need in your cottages or studios to relax, unwind and revel in the fresh Martinborough air. You're only minutes from the famous Martinborough vineyards. This luxury Martinborough food and wine tour is for two to four guests only, for a relaxed and personal experience. This gourmet tour takes you by car with your Zest driver/guide around the small towns of the south Wairarapa: exploring the pretty historical township of Greytown and the celebrated Martinborough wine village. The focus is both fine food and wine, as you savour tastes of both from specialty producers. You will go where few visitors can, meeting innovative people dedicated to being the very best they can be with their premium boutique brands. In a beautiful pastoral setting, big skies and open spaces give way to small, attractive Victorian townships with their own charm. Naturally, the delicious tasting lunch is matched with premium Martinborough wines, possibly from the very vines you can see from the table.